Would you like to have half a pie? Or 3/6 of a pie? If your answer was that the two are the same, then you should do well in this online exercise. This is all about matching equivalent fractions to one another. Six cards are laid on the table, each with a fraction written on it and a pie chart alongside it. 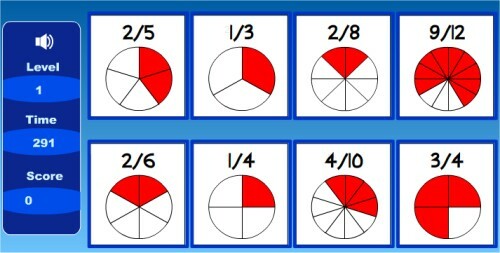 There are three pairs of equivalent fractions – fractions that are the same as one another even though they are written differently, just like that half or 3/6 of a pie. You need to click on the pairs to match them. Once you’ve matched them all, it’s on to the next level. There are two modes – relaxed to practice at your leisure and timed for when you want to go up against the clock. This is a good introduction to equivalent fractions for third and fourth graders – with the timed test there for kids to really show their stuff! The game keeps track of your score as you go along – so you can keep track and try and beat the highest scores!